The St Kilda Visitor Info Kombi is St Kilda’s mobile visitor information centre. It is operated by volunteers and used at tourism trade events, in public relations and promotional activity and appears every Sunday at the St Kilda Esplanade Market. It highlights and promotes everything that there is to see, do, eat, drink and experience in St Kilda and the greater City of Port Phillip area. 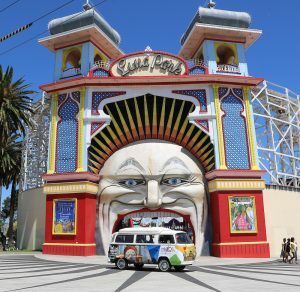 St Kilda and the City of Port Phillip do not service a permanent Visitor Information Centre, so the 1976 VW Kombi Campervan Pop-top seeks to fill part of the gap. We’re looking for volunteers to join our team and help provide information to visitors to the area. Volunteers are equipped with iPads directing people to www.stkildamelbourne.com.au as well as providing traditional collateral including maps, visitor guides and a selection of local businesses brochures and flyers. Provide visitors with personalised face to face service to ensure an enjoyable and fulfilling visit to St Kilda. Provide quality tourist and general information to all visitors through the use of brochures, maps and ipads. Provide recommendations of where to eat, what to do and where to stay in St Kilda. Get to know the tourism industry and learn more about networking and working in the industry.